In a clear message to the Government of Saudi Arabia, a big section of Indian Muslims today in Delhi demanded that the Saudi regime must sign a treaty with all the governments of the world and assure in clear terms that no damage will be done to the cultural heritage of Muslims and sacred signs of Islam in the Saudi kingdom. This was communicated in a memorandum to the Embassy of Kingdom of Saudi Arabia after a peace march at Jantar Mantar which was addressed by Maulana Syed Mohammad Ashraf Kichowchhwi, General Secretary of the All India Ulema and Mashaikh Board, and others. 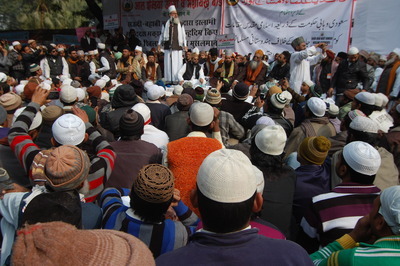 Indian Muslim Demonstration Against Wahhabism, Delhi, January 14, 2013 -- Photograph by All India Ulema and Mashaikh Board. The participants of the rally had come from various parts of the country with banners and placards saying among other things "Indian Muslims will not allow Talibanization of India." Maulana Syed Mohammad Ashraf Kichowchhwi in his speech dealt at length with the activities of Saudi authorities. The behavior with the Indian hajj pilgrims was specially mentioned by Maulana Kichowchhwi, who said that Saudi authorities force Indian hajjis to practice Wahhabism and stop the pilgrims from performing rituals according to their practices. In cases when even offering "Salaam" to the Prophet is carried out silently with a view to avoid offending the rulers, the authorities come down heavily. He said in some cases Indian pilgrims are arrested and humiliated, and the Indian officers sent to take care of the pilgrims lend no support to their fellow citizens and willfully allow the Saudis to play their game fearlessly. He said in the cases of other nationalities their hajj officers and embassy or consulate staff put up resistance and ensure their safety and dignity but this is not the case with Indian officers. The speakers, including Syed Babar Ashraf, National Secretary of the Board, expressed their anger against moves to deface the tomb of Prophet Muhammad and also demanded that the Saudi Government must sign a treaty with the government of India and other governments assuring that no damage shall henceforth be done to any monument of Islam in India. Maulana Mohammad Ashraf Kichowchhwi demanded that all the bulldozed cultural monuments and signs of Islam, including Jannatul Baqee and Jannatul Moalla, must be restored and developed and decorated accordingly. 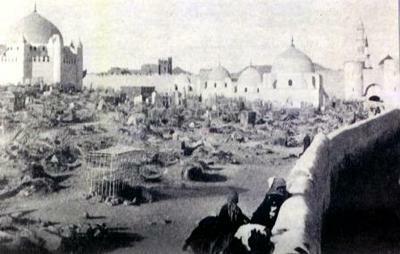 Jannatul Baqee, the cemetery in Madinah of the Family, Companions, and Successors to the Prophet Muhammad sallallahualeyhisalaam, before its demolition by Saudi Wahhabis in 1925. 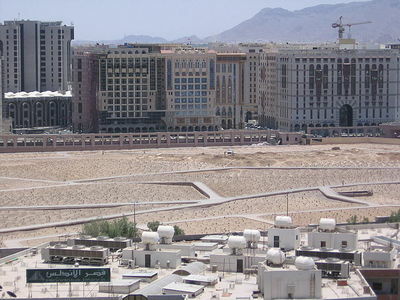 The devastated site of Jannatul Baqee, 2008 -- Photograph Via Wikimedia Commons. The gathering was also of the view that Indian officers sent to Saudi Arabia during Hajj are selected on the basis of their ideology, and Wahhabis are given charge of the Hajj affairs, who have until now demonstrated that they are better suited to serve Saudi Wahhabi interests rather than the interests of Indian pilgrims. 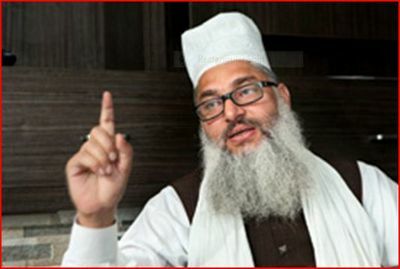 Maulana Kichowchhwi also said that Saudi Wahhabi influences can be easily seen in the government bodies of India requiring Muslim representation. Almost all such selections are done on the basis of ideology and Wahhabis are chosen to represent Indian Muslims ignoring the very vast majority [almost 80 percent]. The Waqf boards and Waqf councils and Hajj committees are by now transformed as the centers of propagation of Wahhabism through government machinery. He said demolition of the Ghausia Masjid in Delhi was not an isolated incident. It is well connected with the developments taking place in Libya, Egypt, Tunisia, Syria, Afghanistan, Pakistan and India and of course in Saudi Arabia, leading them to ruin the cultural heritage of Islam everywhere. In all the above mentioned countries tombs of Sunni Sufi saints and Godly Muslims are being targeted because they happen to be centers of propagation of peace and amity and tolerance in the human race much above individual faiths while Saudi Wahhabi ideology refuses to concede to tolerance and peace its proper virtue. India, home of second largest population of Muslims in the world, with a well recognized and rich Sufi culture contributing to the peace, amity and tolerance in the society, occupies a high place in the comity of Muslim nations. 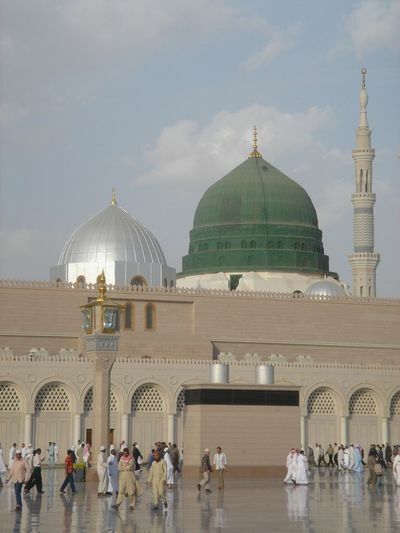 Indian Muslims are aggrieved over the intention and impending move to deface the Tomb of Prophet Muhammad (Peace Be Upon Him) in the holy city of Madinah and demand that the government of Kingdom of Saudi Arabia should assure the world, including the government of India, that they are not going to do any harm to any of the Islamic signs and sites in their country. It is to be noted that Indian pilgrims going to perform Hajj in Saudi Arabia are often not allowed to perform the rituals according to their profession and established practices. They are coerced to practice the infamous Wahhabi ideology against their own beliefs. The Indian officers deployed to take care of the pilgrims on most occasion side with the Saudi authorities and do nothing substantial to help Indian hajjis in performing hajj on the rightful lines of the age old Sufi tradition/practice. It is because the selection is done at the behest of Wahhabi organisations and government authorities send those officers who themselves are also the practitioners of extreme Wahhabi ideology. These people have gained access to the political, governmental and administrative quarters by duping the Government authorities and faking themselves as the true representatives of Indian Muslims. Let it be also mentioned here that in our beloved nation Wahhabism, which endorses extremism, has gradually gained a powerful position by projecting themselves as the real representatives of Indian Muslims, which is totally untrue because more than 80 percent of Indian Muslims profess and practice Sunni Sufi ideology which preaches love to human kind. Almost all the bodies of government requiring Muslim representations have been hijacked by these Wahhabis and thereby the vast majority of Muslims goes unheard, unrepresented and badly ignored. Wahhabis, getting their foothold in the corridors of political power are now trying to dictate politics and their activities which started with a socio-religious message finally turned into a political entity thus becoming a threat for the democracy of India and the social fabric of our beloved nation. These elements play with emotions of peace-loving Muslims and arouse the religious sentiments to create chaos and benefit themselves both socially and politically. All India Ulema and Mashaikh Board, through this memorandum request your kindness to come to the aid of the Indian Muslim community and make the Kingdom of Saudi Arabia government respond regarding plans for expansion of Masjid-e-Nabvi [The Prophet's Mosque] and other sacred Islamic places in Makkah and Medinah. This is in no way an interference in domestic affairs of Saudi Arabia because these sacred places are the center of reverence for the Muslim Ummah all over the world. It will be in the fitness of things if the Government of Saudi Arabia agrees to issue a White Paper and spells out the expansion program, while signing a treaty with all the governments of the world assuring it will not deface, demolish or destroy any of the signs of Islam, and restore all those sacred sites, including Jannatul Baqee and Jannatul Moallah, that have been bulldozed in the last century by the Saudi dictators. The insanity of the Wahhabi Saudi regime has reached its zenith and now the Tomb of Prophet Mohammad (Peace Be Upon Him) is under threat, hence this earnest appeal from this leading body of the majority of Indian Muslims. Maulana Syed Mohammad Ashraf Kichowchhwi.